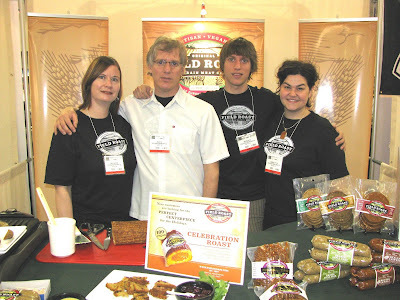 Field Roast attended the Natural Products Expo Show in Anaheim, CA! For those of you who have never been to a large trade show of this magnitude, it is quite an experience indeed! New Hope Media is a Colorado based company that runs the details of these shows, one on the west coast, and another on the east coast. The Anaheim convention center is just 5 torturous minutes from Disneyland, and really a beautiful space. Many current customers came around to greet us, and it was really great to put faces to the voices I talk to all the time on the phone. When you sit at a desk most of the time, meeting people is truly exciting! We met tons of great people and signed up to go again next year!